Chef TV, internet food blogs, and the proliferation of gourmet shopping venues, have ignited people’s passions for new culinary experiences. The custom of eating a meal simply to satisfy hunger is passé. This increasingly refined interest in food and alcoholic beverages, both preparing and consuming, has launched the new trend in culinary tourism. 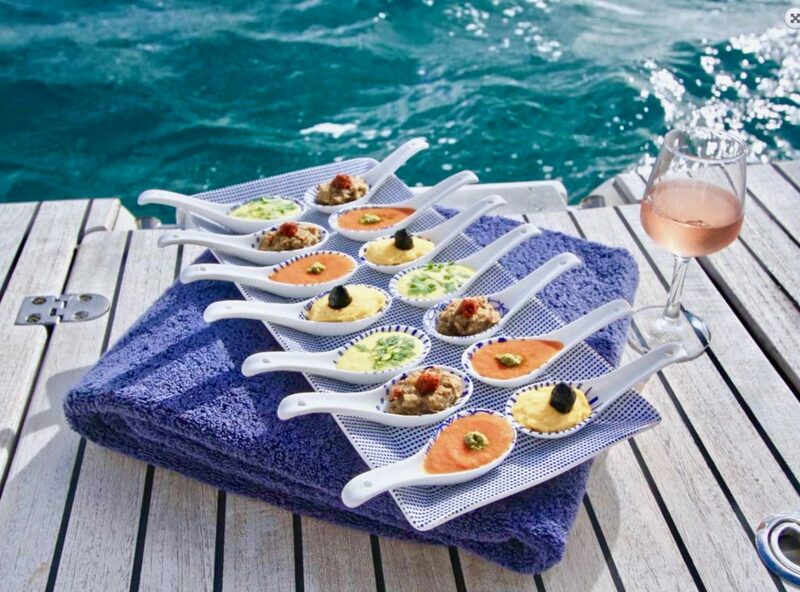 Now, thanks to gourmet yacht charters, food tourism is making waves. More and more, charter yacht owners believe that hiring top chefs as part of the crew is essential. Not just to please the palate, but as a strategy to rank highly in the competitive charter industry. An excellent yacht chef is a mark of distinction. These chefs not only bring haute cuisine to the dining table, they often provide hands-on classes to interested guests. To wet your appetites in this series, Gourmet Yacht Charters profiles award-winning yacht chefs that step up to the plate. 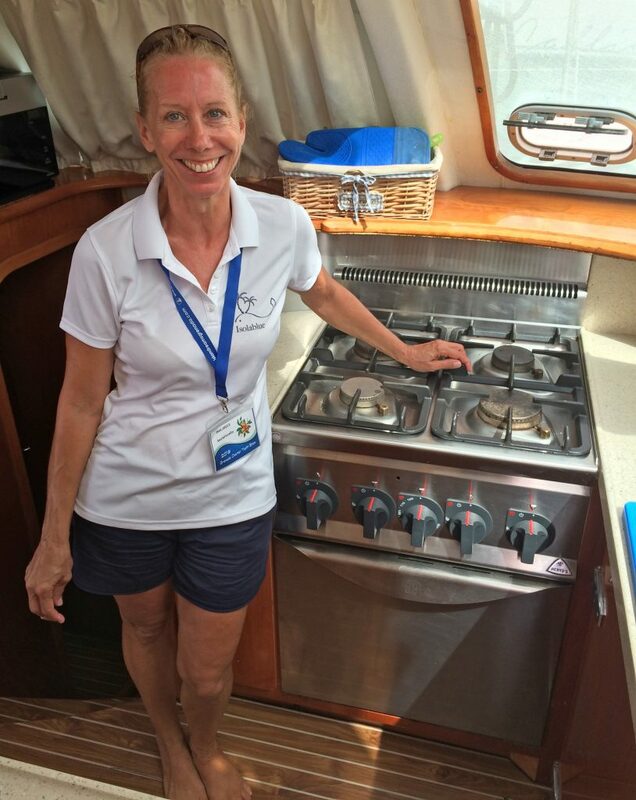 We provide insights into their onboard cooking styles and teaching strategies. Gourmands who are prospective charter clients, now you can have your cake and then some. Because, a week of spectacular dining on a private yacht is more than a luxury vacation. It’s a privileged experience. 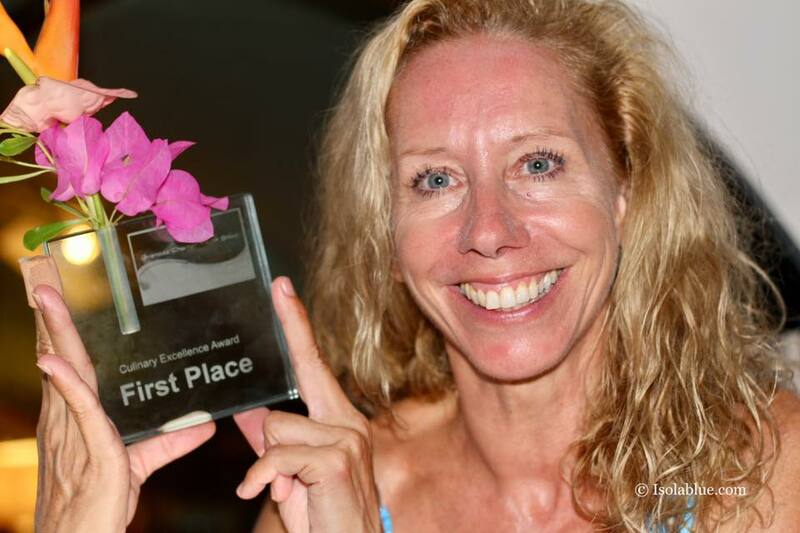 In fact, Astrid’s cooking is so good she won first place in the Culinary Excellence Competition at the Grenada Charter Yacht Show 2018. Try her recipes in your galley or kitchen! What makes Astrid such a remarkable gourmet yacht charter chef? She says it all began when she was a child “in the aprons of the cooks of the family restaurant”. Astrid is from Switzerland, a country with its own marvelous cuisine, as well as regional dishes influenced by its German, French and Italian neighbors. Growing up in her father’s restaurant, cooking was the family way of life. She was immersed in the warmth of the kitchen, the wonderful aromas, delicious recipes and beautiful presentations. It was a blissful childhood that evolved naturally into a lifelong passion. What makes Astrid’s cooking most unique? For Astrid, food is a wholistic experience. The recipe must be superb, but like perspective in fine art, must be perfectly balanced with the surroundings. An aromatic plate served with the background view of the turquoise sea is meticulously crafted to create a perfect ambiance of relaxation. Food therapy. 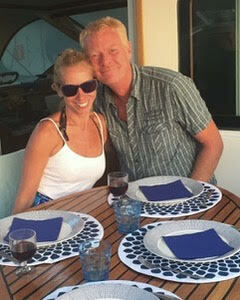 How did you learn to be a gourmet charter yacht chef? I learned mostly every cooking technique from the best chef I could dream of – my father. One of the most important lessons he taught me was to pay painstaking attention to details. I’ve done a lot of self-educating as well. Mastering more complex techniques, like the aesthetic beauty of presentations, is something I’ve done gradually. I’ve been fortunate to enjoy eating meals at highly-rated restaurants all over the world. Travel has let me discover a variety of different cuisines. I’ve explored exotic markets and experimented with novel fragrant herbs and foreign spices. So, I’ve continually expanded my culinary repertoire. These experiences have helped me perfect how I want things to be prepared and served. But this doesn’t mean copying. My aim is to be unique. My original style is the result of many years of cooking experience. I’m passionate about gourmet fine food from all over the world. My recipes are mostly inspired by contemporary Mediterranean and Asian food. However, I always add a French touch. My favorite cuisine would be a balanced fusion cuisine served in beautiful surroundings. I am proud to serve the dish when the meal is presented with aesthetic beauty and paired with the perfect wine. What are the challenges of being a gourmet charter yacht chef? Dexterity, creativity and stamina are imperative for a chef at sea. Of course, you must be resistant to seasickness. A very important responsibility of the chef is food and beverage provisioning. You need to source first-class quality and the right quantity of products. For some charters I need to prepare special diets. This means knowing where to provision for them. Don’t forget about the small cooking and storage spaces, so organizing is essential. 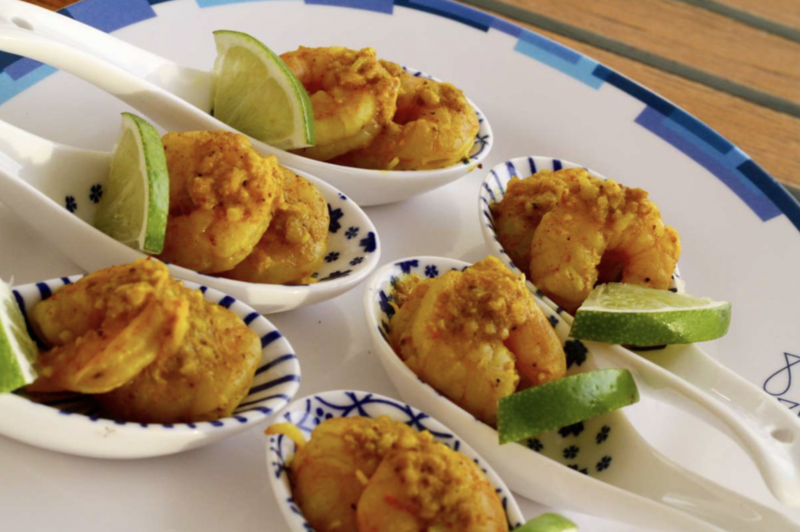 Sometimes it’s difficult to follow recipes because not all ingredients can be found in the Caribbean. In this case, I buy market fresh ingredients and adapt my recipes accordingly. Being a yacht chef is highly demanding, but highly rewarding. What do you love most about being a gourmet charter yacht chef? When you’re passionate about cooking and love yachting it’s a dream job. 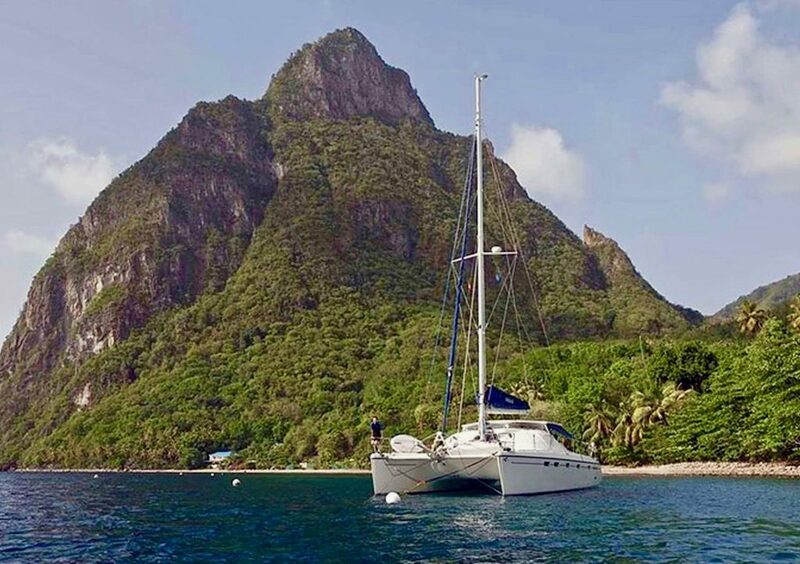 Imagine sailing to the most beautiful places on earth. Inventing new recipes inspired by local ingredients and spices. I travel with my own kitchen. Plus, I simply love to learn. 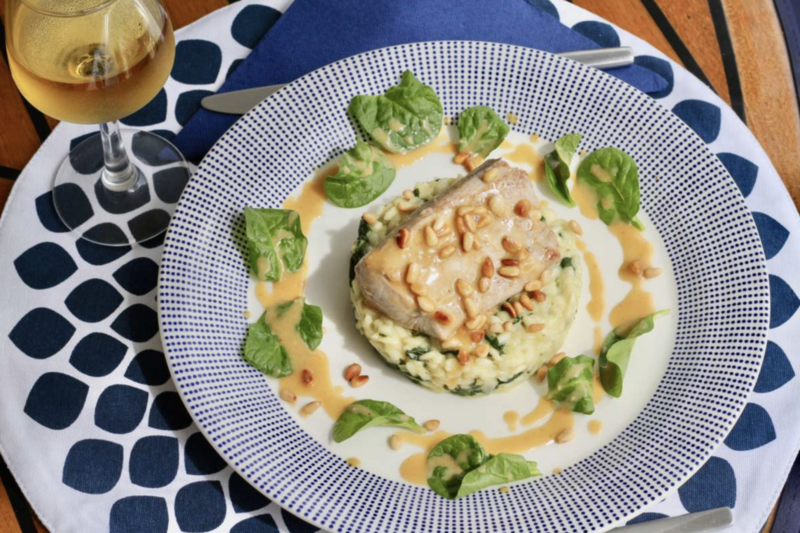 Traveling while cooking on a charter yacht allows me to practice new techniques, adapt local dishes, experiment with new herbs and spices, and continually expand my knowledge. The fact that there is always something new to learn and new horizons to discover motivates me a lot. Sharing my passion for cooking and my passion for the sea with my husband makes me overall happy. On top of that, I have the chance to meet wonderful people and to share this amazing adventure with them. Enjoy luxury living at sea! ISOLABLUE is a master build inside and out. Beautiful interiors feature elegant built-ins, stylish upholstery and high-quality joinery and finishes. The salon and dining area are spacious and flooded with daylight. Three roomy cabins are ideal for up to six guests. Captain Laurent is a licensed PADI instructor and Chef Astrid is a licensed PADI Divemaster. They offer one “discover scuba diving” or a dive per person with a minimum stay of seven nights. Astrid and Laurent get rave reviews from their charter clients. They look forward to welcoming new guests, making new friends, and sharing unforgettable moments in the dreamland of the Islands. Embark on an international journey for the taste buds. Escape on ISOLABLUE. 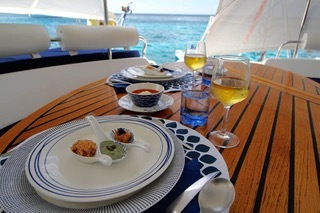 Contact Select Yachts to book your gourmet yacht charter chef Astrid and lovely sailing catamaran Isolablue today! Destination Alaska Annapolis - Maryland Antarctica Arctic Australia Bahamas Belize California Canary Islands Caribbean Leewards Caribbean Virgin Islands Caribbean Windwards Central America Croatia Cuba Dubai Florida French Polynesia Galapagos Great Lakes Greece Indian Ocean and SE Asia Mexico New England New Zealand Northern Europe Pacific NW Red Sea South America South China Sea South Pacific Turkey United Arab Emirates W. Med - Spain/Balearics W. Med -Naples/Sicily W. Med -Riviera/Cors/Sard.